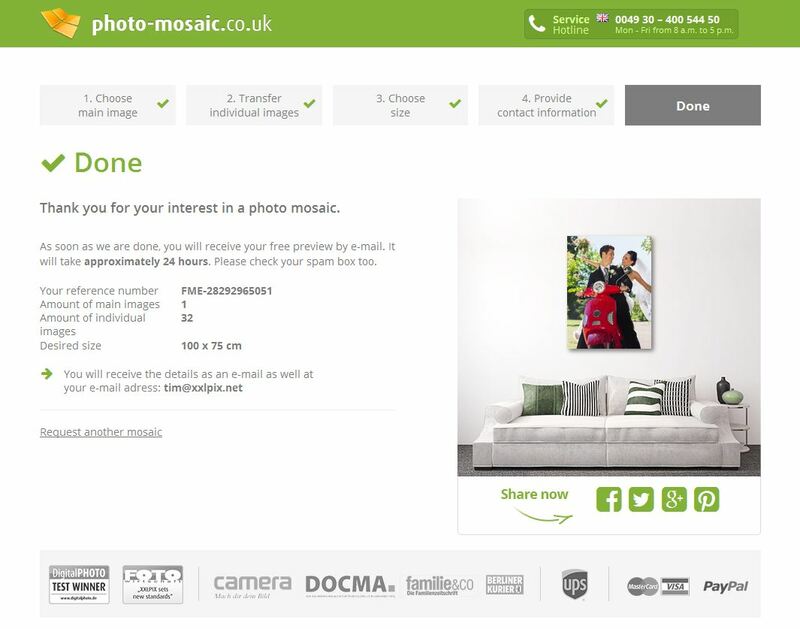 Click on „create mosaic“ and choose the main image as the first step. This photo will be seen in a large size on your mosaic. The photo has to be a JPEG file. The resolution of the file should be more than 1500 x 1500 Pixel (about 2 megapixels) or have a file size over 1 megabyte (MB). You can upload photos with a size of up to 20 MB. The main image must be in one of the following formats: 4:3 (digital photo format), 3:2 (classic format), 1:1 (square format), or 2:1 (panorama format). If your photo has a different format, you can crop it after uploading. The photo file can also be a logo, symbol, or something else. It just has to be a JPEG file. A colorful main image with strong contrast looks great as a finished mosaic. The photo does not need to be very detailed. Small details will not be visible in the mosaic anyway. Now you can upload the individual photos which will be seen as small pictures in the background. You should upload at least 30 individual pictures. The more individual photos you upload, the more will be seen in the finished mosaic. A minimum of 30 individual photos should be uploaded. You can upload a maximum of 1000 photos. The individual photos also need to be JPEG files. The individual photos can be small files. 50 kB oder 500 x 500 pixels is a sufficient size. Larger files only make the transfer time longer. Depending on your photo size, amount, and your internet connection, the transfer can take between 3 minutes and 2 hours. The transfer cannot be cancelled during that time. The colors of the individual photos do not need to match the colors of the main one. The colors of the mosaic will be automatically adjusted to get the best result. 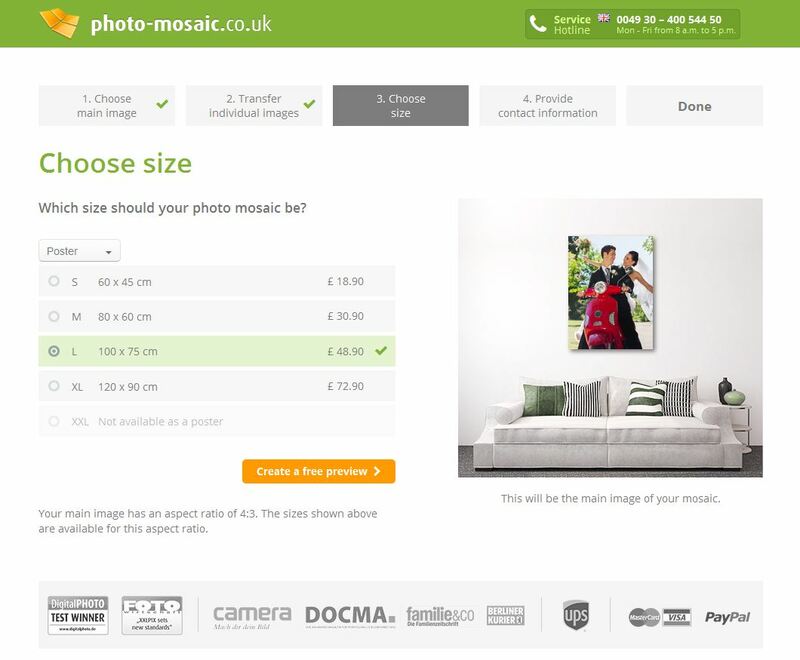 Now you can choose in which size your mosaic should be created. It can then be printed in the size that you decided on. Which size is closest to the DIN format? 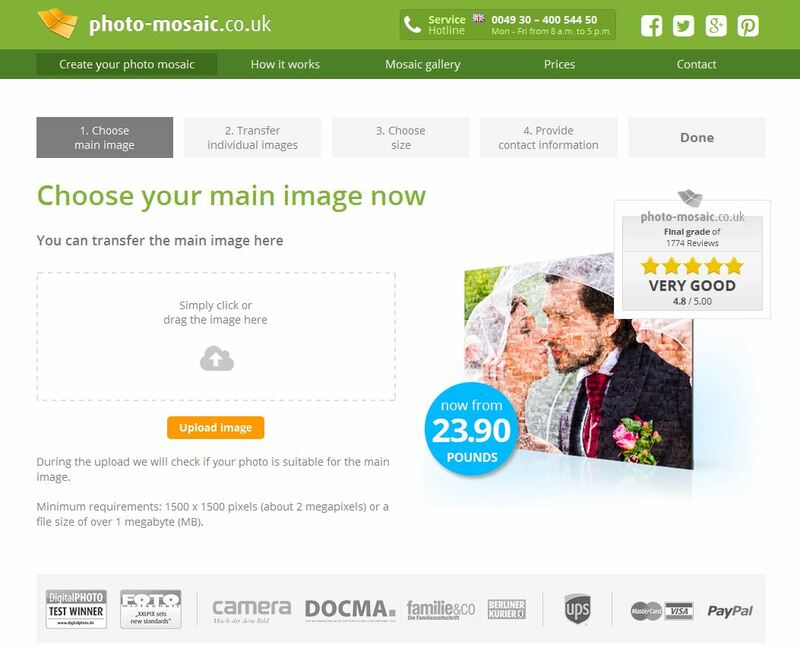 How expensive is a photo mosaic? We can create a photo mosaic for you for free and without any obligation to order. In this step you can let us know how to notify you when the mosaic is ready. It takes about 24 hours. Please make sure that there are no typos in your email address. We want to be sure that you are notified when your mosaic is ready. It usually takes 24 hours to create your mosaic.. On weekends it can take a bit longer! 5. Now it’s our turn! Now you can relax. It’s our turn! In the last few years we have already created many thousands of mosaics. Now we will create the most beautiful mosaic using your pictures. We will notify you by email when your mosaic is ready. You can view the finished mosaic online and decide if you would like to order it. If we aren’t quite sure what is best, we will make two versions of the mosaic for you. Then you can decide which one you find best. With our viewer (the way to see your mosaic) you can also zoom in on the picture and see the small individual photos. 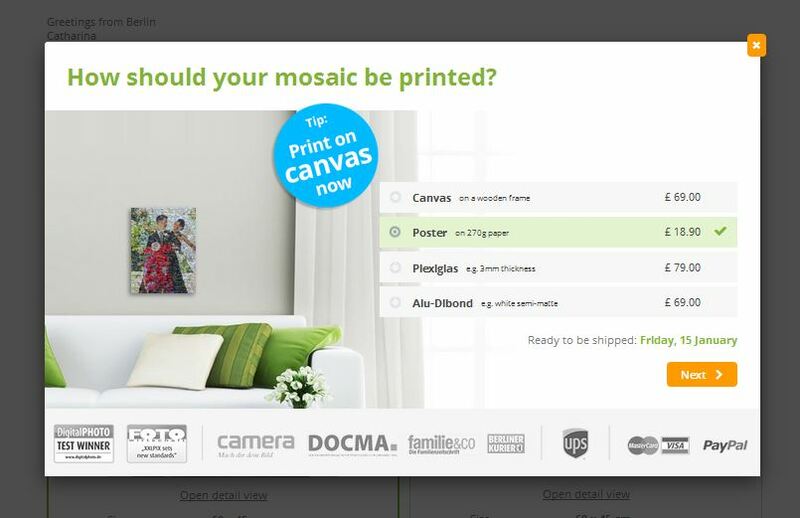 Here you can choose which material your mosaic should be printed on. 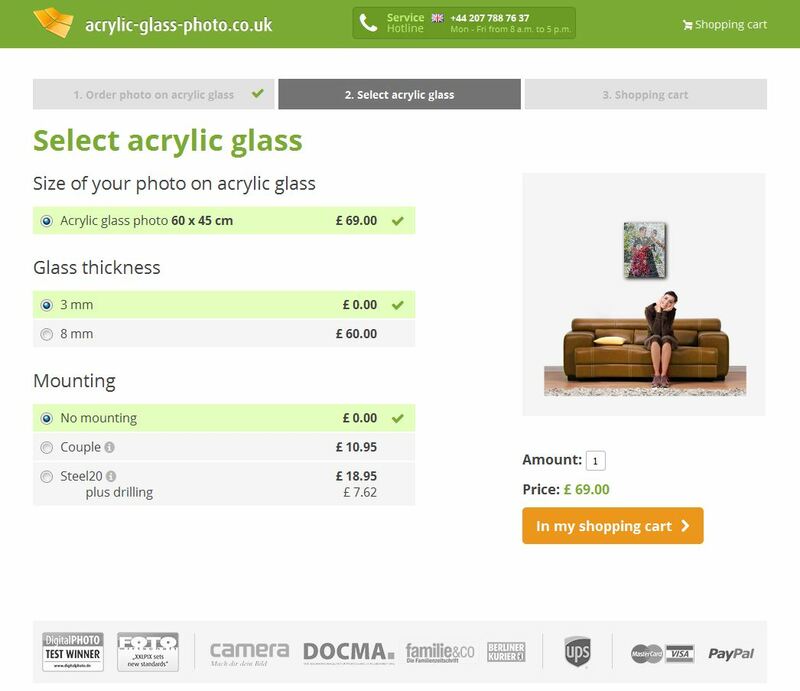 We offer 4 different materials: poster, canvas, acrylic glass, and Alu-Dibond. 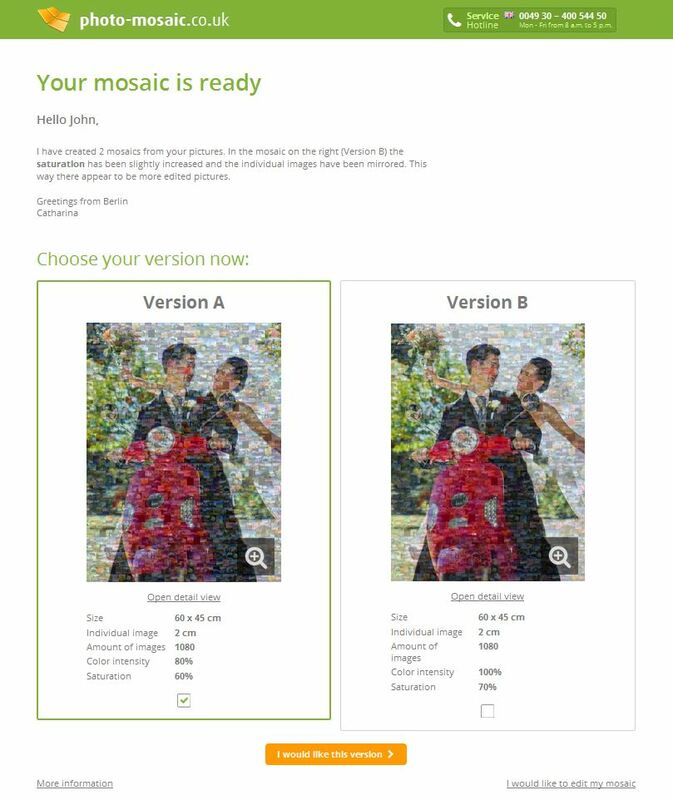 There isn’t any right answer to which photo product fits best with your mosaic. 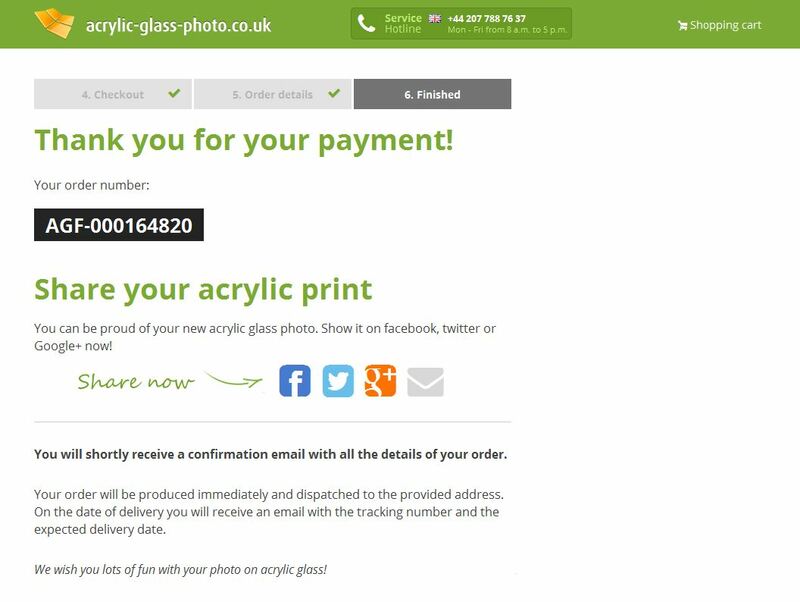 Posters are the cheaper version, while canvas, acrylic glass, or Alu-Dibond prints are very high quality. Choose the finish for your photo product. We also offer mountings. 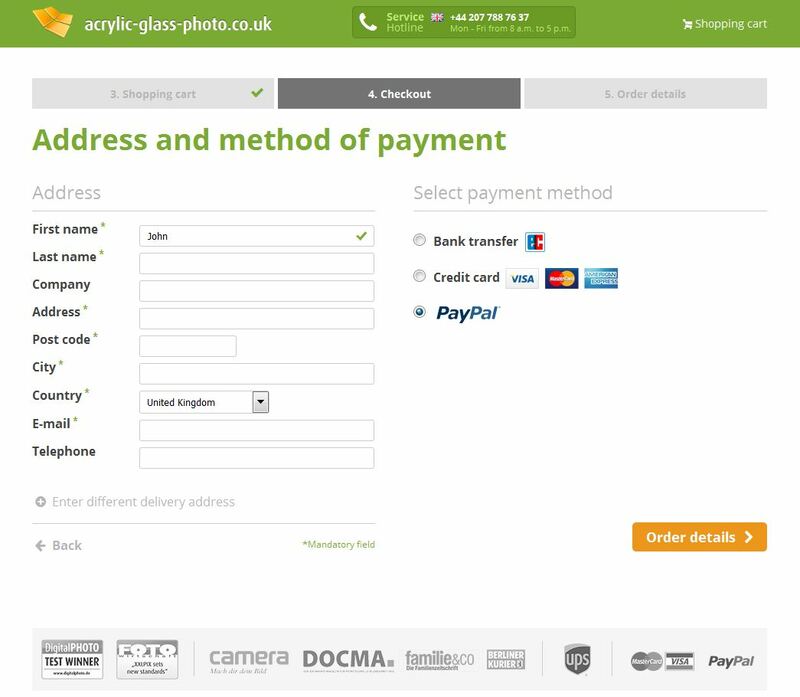 Now you can enter your order details and provide a different shipping address if you need. Express shipping is also possible! 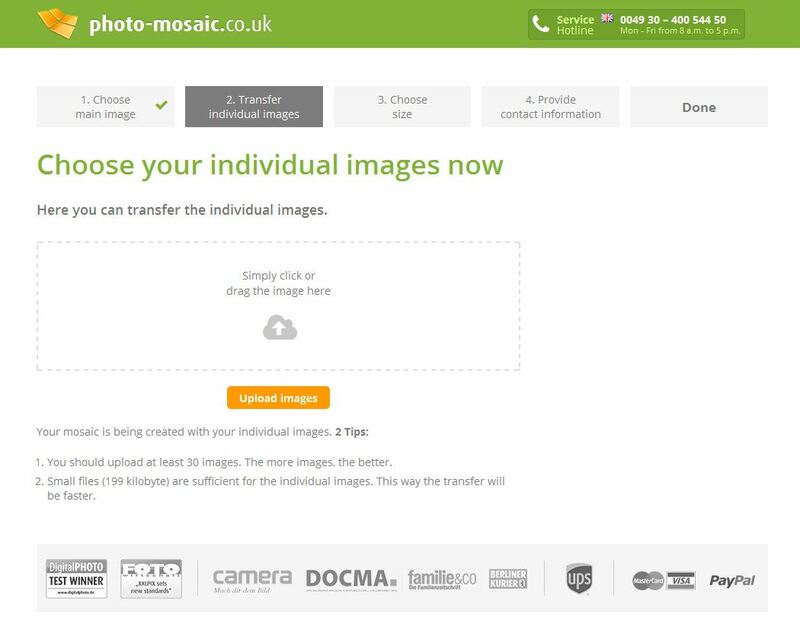 By entering a different shipping address you can send the mosaic directly to an event if you want. There is no receipt in the package. The recipient will not be able to see how much the mosaic cost. The receipt will be sent by email and regular mail to the provided address. We also offer express shipping. If you are in a rush, you can find suitable shipping options here. Now the mosaic will be printed and sent to you. You will receive a confirmation by email. Depending on your shipping selection it can take between 24 hours and 4 days. Our packages can be tracked online. 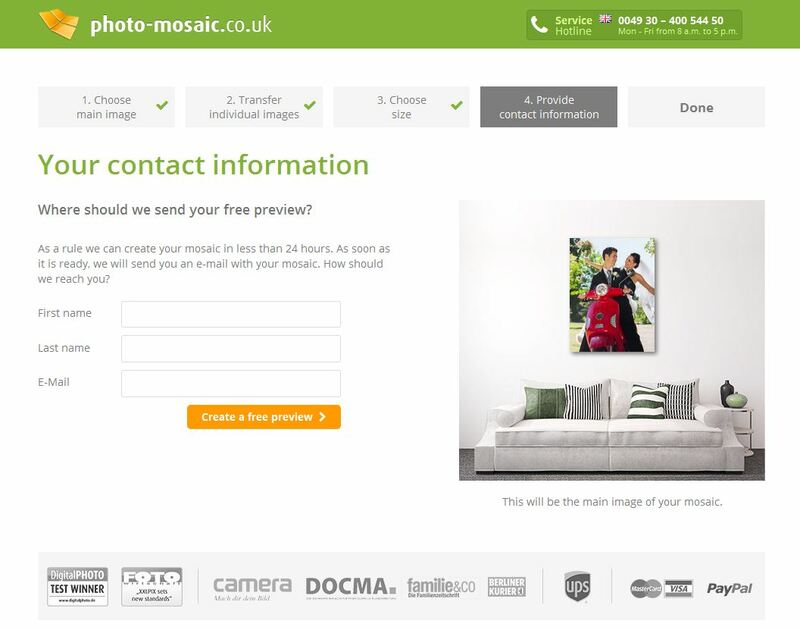 As soon as your mosaic has been shipped, you will receive a confirmation email. There you will find the tracking number for your package. You can reach us by calling us during our service hours Monday – Friday, from 8 a.m. to 5 p.m. Minimum requirements: 1500 x 1500 pixels (about 2 megapixels) or a file size of over 1 megabyte (MB).